Two weeks to go until Grand Designs 2014! With only two weeks left until the opening day we are busy preparing for Grand Designs Exhibition 2014. The doors to Grand Designs Live 2014 open on the 3rd of May and, here at Shutterly Fabulous, we’re working on the final preperations. As ever, we’ve kept our commitment to quality, and developed a stylish and interactive stand with Columns, our Creative Communications agency. Strikingly eye-catching, this bright and bold stand is truly Shutterly Fabulous and our friendly, knowledgeable staff will be on hand to answer questions and assist with any queries you may have. 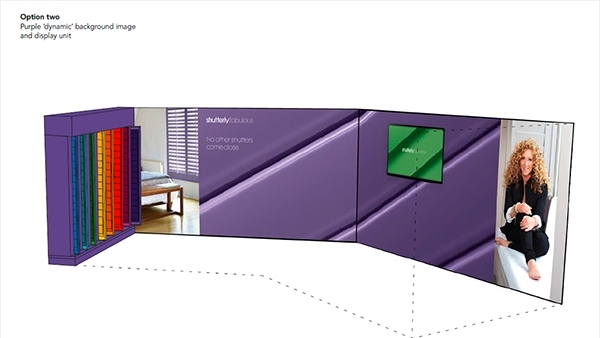 With the opportunity to win £3000 worth of shutters and some shutterly delicious treats to give away, make sure you navigate your way through the Excel to find us at stand L103, at the entrance to the Interiors section. As a bonus, book now and get 2 for 1 on standard tickets. Visit www.granddesignslive.com and enter the code SHUTTERLY241 to claim your discount. *Terms & Conditions – Transaction fee of £1.70 applies per order. Tickets must be booked in advance. Offer ends 11/05/2014. Offer valid on standard admission tickets only. Saving based on the door rate.